PaGozar is a latin band based in Manchester, in the North West of England. They are experienced in providing music at all types of events, from corporate functions to festivals and weddings. PaGozar is normally a five piece band but can be flexible from 3 to 7 in size. This Cuban Salsa band is based in the North West of England, experienced in providing music at all types of event, from corporate functions to festivals and weddings. They are ideally based for Manchester, Sheffield, Leeds Birmingham and the North, but perform throughout the UK and also in Europe. As well as Salsa, the band's repertoire includes traditional Cuban Son music, Latin party music and other styles. Whatever type of event you are planning, PaGozar will meet your needs. PaGozar was formed in 1994 by percussionist Ric Parmigiani, who is a permanent member of the Manchester Halle Orchestra. The band is made up of professional musicians specialising in Latin rhythms. All the band members dance Salsa and much of the music is geared towards the requirements of dancers. Although PaGozar normally work as a five-piece, they can work with additional horn players to form a larger band if required. Members of the band travel regularly to Cuba and other parts of Latin America where they rehearse and perform with local musicians. This helps them to keep up to date with the latest trends in Latin music and also allows them to immerse themselves in all aspects of the music, dance and the local culture. PaGozar specializes in a wide variety of Latin music styles suitable for dancing and also as background music. Latin American favourites like Guantanamera, La Bamba and Oye Como Va. Songs of the Gipsy Kings such as Bamboleo and Volare. Traditional Cuban music including various hits by the Buena Vista Social Club. Other Latin styles such as Merengue, Bachata, Cumbia, Guajira, Son, Cha-Cha, Bolero, etc. 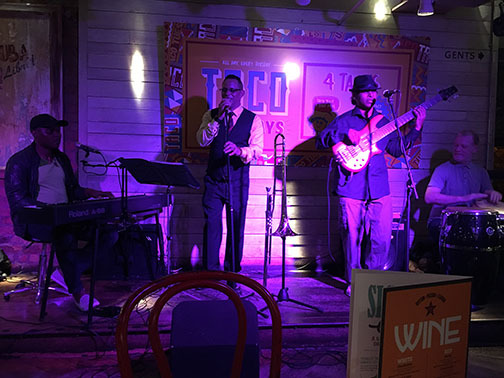 As well as playing at weddings, corporate functions, salsa parties and other events, PaGozar also perform at larger, more prestigious functions. Recent venues include Manchester Town Hall, Bradford Bulls Rugby Stadium, Manchester's Royal Exchange Theatre, Blackpool Chilli Fiesta and the Monmouth Festival. Bring the atmosphere of Cuba to your party!